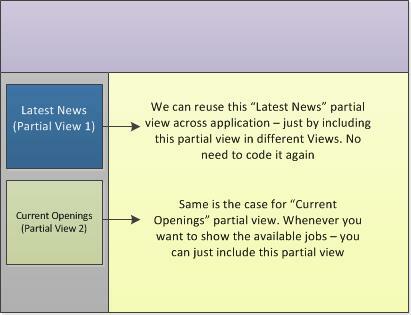 Partial Views are just views which we can reuse across your ASP.Net MVC application. You can think Partial View as a reusable control. You don’t need to write code for them every time – You can drop Partial View like a block wherever you want to and content of the partial view would be displayed. Consider the below web site of a company – it’s a usual web page where we have header, sidebar and content view. 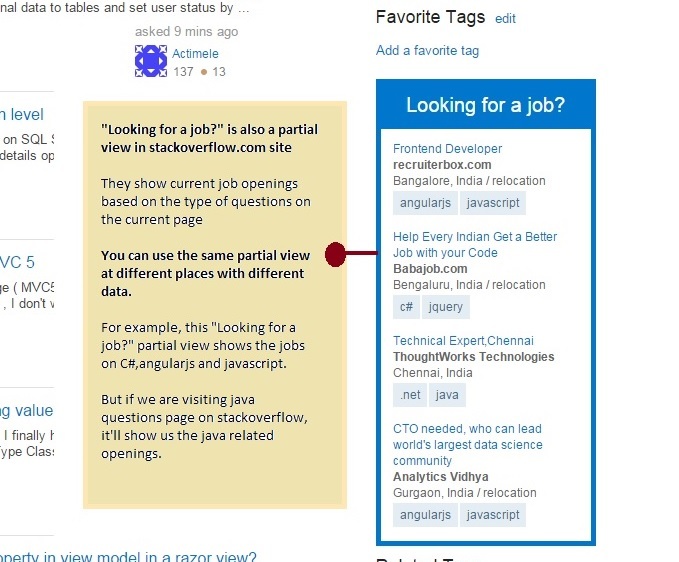 But our point of interest is the two content blocks in side bar – “Latest News” and “Current Openings”. “Latest News” would tell you the latest news about the company and “Current Openings” shows the available jobs in the company. We might want to display these information (Latest news and Current Openings) in various places of our web application. Instead of writing code every time to display the same piece of information for different places, we can create partial view and just call it from different places with different data. 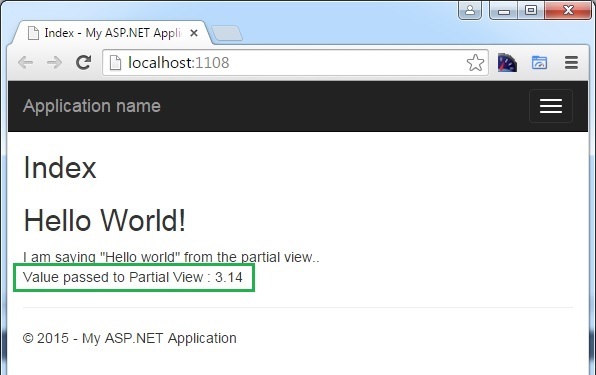 I have created a simple ASP.Net MVC application using Empty template and added Home controller with Index action. 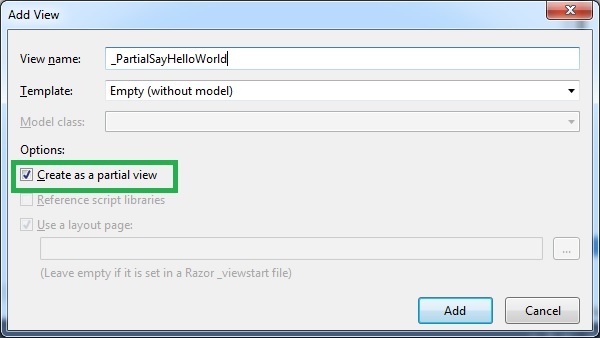 Below dialog box for adding view will appear. This is the content that I would like to reuse across different views. Now, let us see how we can include this partial view content in our Index view. 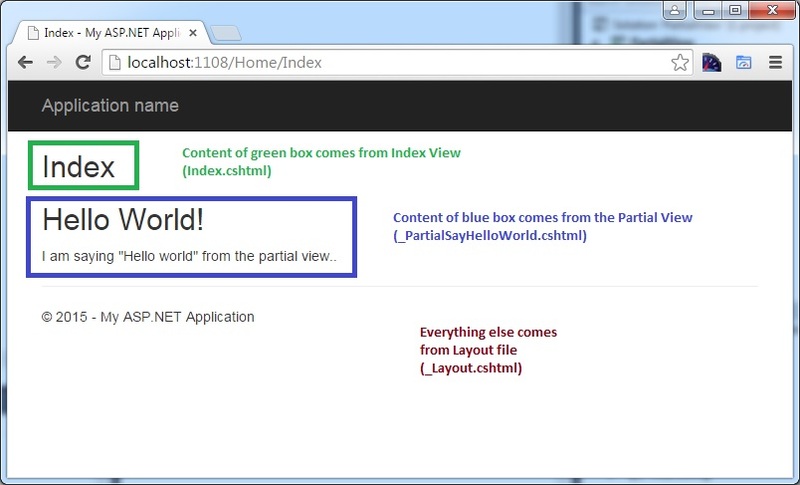 @Html.Partial is the HTML helper that we can use for including the partial view content to our View. 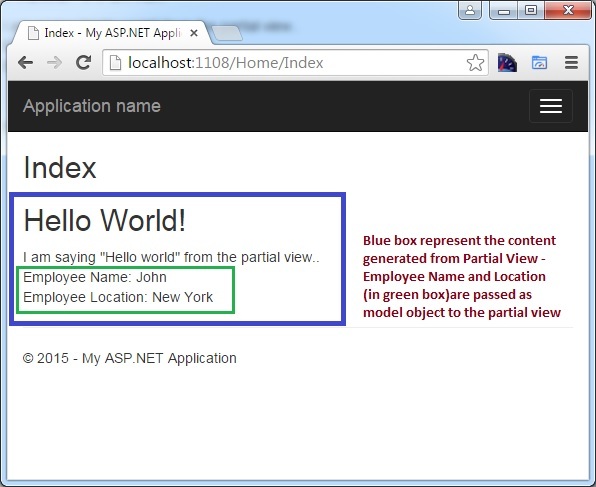 Below is the complete Index view content– where we are passing the partial view name to @Html.Partial method. The partial view we have created so far is a static one – the generated content is same always. But in many cases, we would be passing some data and we want the content to be generated using that data. We’ll see how can do so in upcoming section. I want to pass Pi value(3.14) from my controller to the partial view. I have added that pi value to the ViewBag – as shown below. And, we would be passing this pi value to the @Html.Partial method as the second parameter. Please note that we need to cast it double as we could not pass dynamic expression. I am saying "Hello world" from the partial view.. In Models folder, I am creating Employee class. And, I’m creating an instance of Employee object. In real world, you would be getting this value from db. And pass that value to the view as shown below. You need to pass the model object to the partial view. You need to pass the model object to second parameter of @Html.Partial method. If you like this article, please subscribe. I’ll send you useful articles along the way.